When enabled, Gratuity for Pet Sitters includes a simple, unobtrusive call-to-action in the pet owner’s appointment summary email. To make giving more convenient, Scout includes a simple, unobtrusive call-to-action in the pet owner’s appointment summary email. If a pet owner wishes to tip their dog walker or pet sitter, they are presented with three pre-defined options based on the service price and the ability to enter a custom amount. The gratuity is automatically added to their invoice and reflected in the payroll report. Navigate to Settings > Billing and scroll down to the "Staff Gratuity" section. Simply toggle the switch to enable gratuity. Navigate to Settings > Business and scroll down to "Branding." From here, you can select a primary and secondary color. 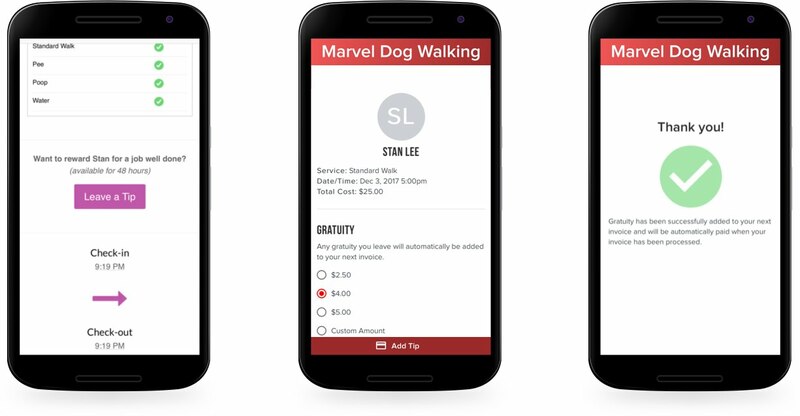 Check out the preview to see how your selections will show up to your customers when they choose to leave a tip. Navigate to Reports > Payroll. Choose the period for which you would like to pay staff. The gratuity amount is displayed both directly in the payroll summary and the payroll details for each staff member.